What’s the opposite of “triggering”? Last Friday, my daughters and I went to see cross-town rival Squalicum High School’s fall musical, 9 to 5. I’ve always loved the classic 1980 movie, but I’d never gotten around to seeing a production of the recent Broadway musical. I don’t think I’ve seen an actual “high school musical” since the 1980s. There was no need – my own kids have only made it to middle school so far. I thought I had at least another year before I would have to accompany them to, and/or watch them perform in, a high school musical. There were good reasons to wait as long as possible. (Hush, not your typical philistine or deadbeat dad reasons.) 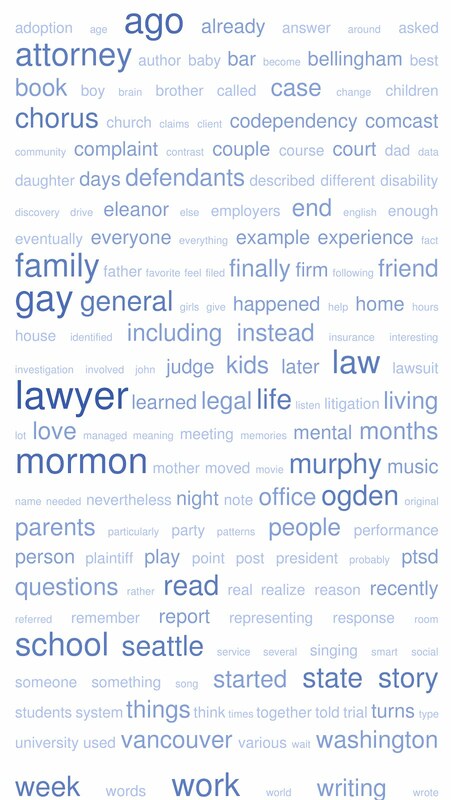 Although my PTSD symptoms burst out only three years ago, they were rooted in trauma that occurred three decades before, during my overachieving-and-closeted Mormon youth. Musical theatre was at the center of my life when all that trauma was occurring. High school musicals should be triggering. As it turns out, I didn’t need to worry. Squalicum High School’s production of 9 to 5 was like a magically updated version of all my fondest memories from high school. There were the same divas, dancers, excitement, and enthusiasm I remembered from thirty-five years ago. However, there also were some obvious differences from Utah in the 1980s. 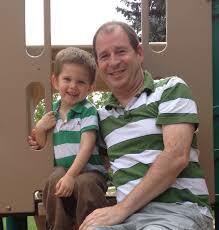 Squalicum High’s beloved drama teacher is openly gay. His husband leads the battalion of community volunteers helping the students put together an amazing show on a miniscule budget. 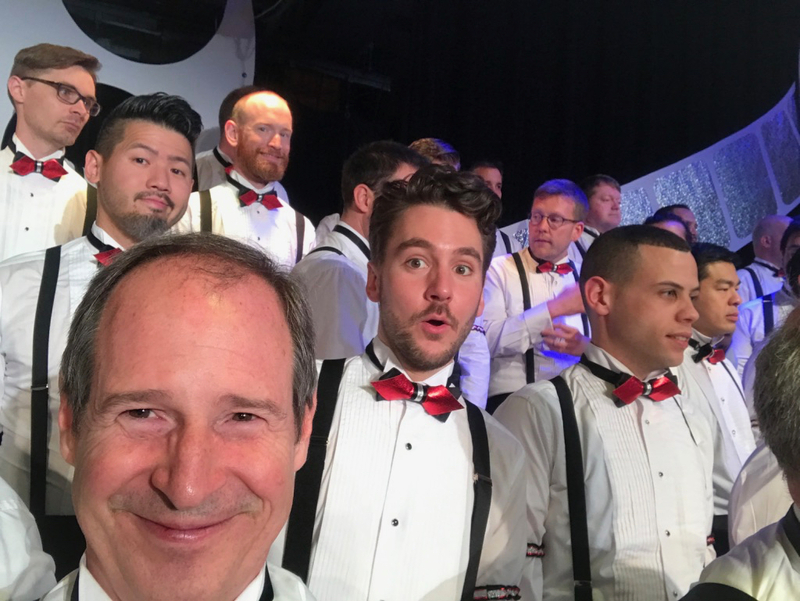 The diverse crowd on stage, in the crew, and in the audience included nerds, jocks, Mormons, gay boys, lesbians, and transgender students – all having fun and supporting each other. Virtually all of my happy memories from the early 1980s involve either theatre or family. Watching 9 to 5 at Squalicum High School with my daughters evoked the same glow we used to get from the affirming and trauma-free moments in Glee. High school musicals are filled with drama. They're also filled with Drama Queens. I already live with one in training. One of the chorus members from 9 to 5 arranged for our tickets. We originally planned to attend a matinee last week. But it turns out my daughter Eleanor’s best friend from Lutheran summer camp goes to Squalicum High, and she had one of the show’s three staring roles. Because the leads were double cast, we had to switch our tickets to a night with the correct ensemble. Friday dawned on the brink of tragedy. Eleanor’s friend had lost her voice, and she would never be able to go on that night. Snapchat buzzed. We would have to inconveniently change performance dates once again. 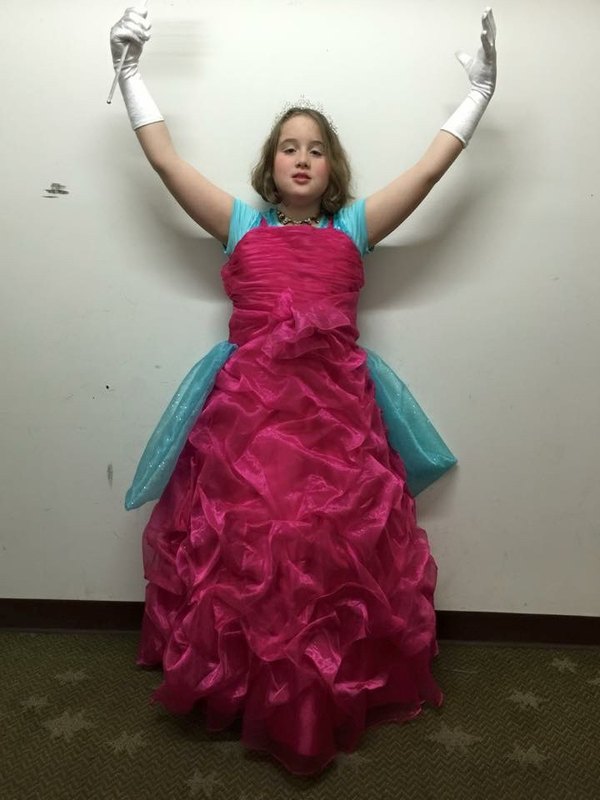 Fortunately, as the father of a Drama Princess, I was pleasantly unsurprised to hear Eleanor’s friend in full voice at Friday’s production of 9 to 5. She was amazing. All three of the show’s leading ladies, playing the roles originated by Jane Fonda, Dolly Parton, and Lily Tomlin, were amazing. In one of the blog’s all-time most popular essays, I wrote about the many times “Drama Therapy” saved my life. Starting in high school. After my family moved from Vancouver to Utah, I found my first life-saving island of misfit toys at Palace Playhouse. An over-enthusiastic drama teacher at Box Elder High School had somehow convinced the school administration and the owners of the historic bank building in downtown Brigham City to give us the use of the cabaret space on the bank’s top floor. For decades, Palace Playhouse was a student-managed theater company that produced musicals and plays year round (until the principal and the fire marshal finally pulled the plug ten years ago). Palace Playhouse redeemed high school for generations of awkward BEHS grads. Since graduating from law school, I’ve channeled my dramatic urges into a series of excellent gay men’s choruses in Chicago, Seattle, and now Vancouver. Last Sunday, Vancouver Men’s Chorus did our annual out-of-town outreach performance in rustic Chilliwack. 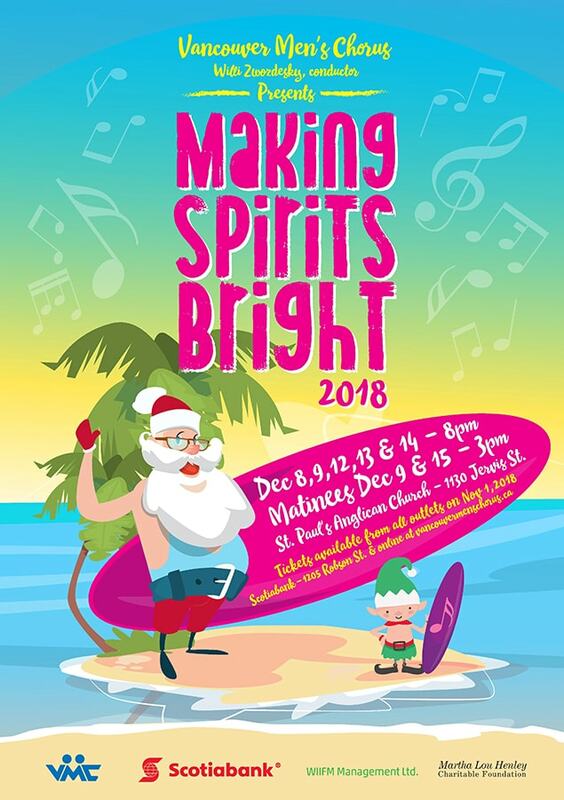 The regular run of Christmas concerts begins next week in downtown Vancouver. For only the second time in three decades, I will be braving my anxieties to sing a four measure micro-solo. It's actually more of a dramatic role. Just like last year, I've been faux typecast as the outnumbered Jewish guy. Occasionally I point out some of the preposterous coincidences in my life. As I wrote this spring in "Take that, Logoskeptics," I am comfortable describing myself as a Black Swan Event. My mother and my nephew have been recommending a new barbershop in Bellingham. I finally went on Saturday for my pre-concert-run haircut. The chatty stylist revealed he graduated from Brigham Young University the same year I did. I ended up getting my beard trimmed too because we had so much to talk about. My new barber and I had never crossed paths in Bellingham. Nor in Utah thirty years ago. To the contrary, we exemplified two of the common closet strategies of that era. He avoided all politically active students, while I avoided all potentially gay students. Guess who got laid in college. The most interesting dish involved my stylist’s first boyfriend. I knew him. Or rather, I knew of him. The boyfriend's father was a prominent Mormon leader. According to Facebook, the son is still in Utah, now married to a man. 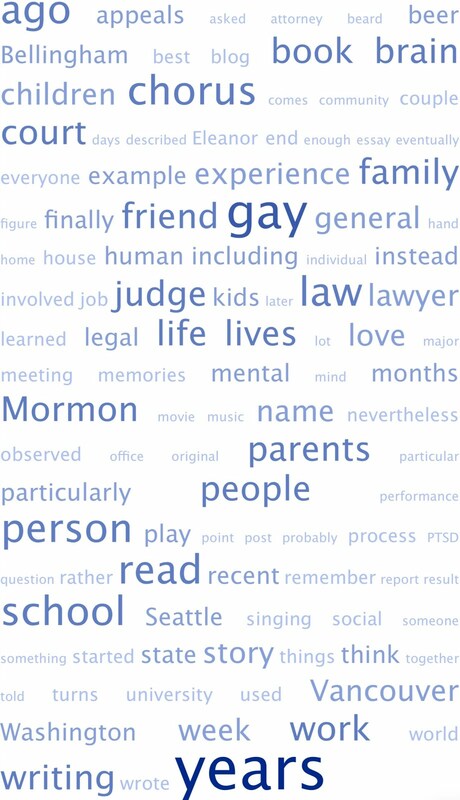 We share five Facebook friends – three eminent gay Mormons and two fellow travelers. Thirty years ago at BYU, I already knew this guy was gay. I don’t remember how I knew, I just did. Primitive gaydar? In any event, I avoided him like the plague he represented. Watching a high school musical together with my teenaged daughters recalled the magical theatre experiences of my youth – except without the toxic proportion of Mormons everywhere, and without being warped by the entire culture’s pervasive homophobia. Sharing an evening with all those straight and queer Bellingham teens felt amazing. 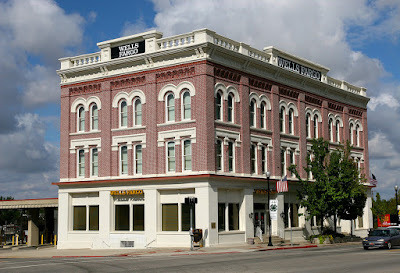 Sadly, gay life today in Brigham City and Provo is still very Mormon, and still very warped. For example, I previously wrote about the attorney-turned-senior-apostle who has taken up the Mormons' anti-gay mantle. Just last month, Brother Dallin gave yet another grotesquely homophobic sermon during General Conference. I barely noticed. As they say in a proverb Mormon leaders are fond of quoting, “The dogs bark, but the caravan moves on.” Unlike poor clueless Roger in 1980s Utah, any young gay Mormon growing up today can easily see he is not alone. It’s not just the brave new gay world that arose after the advent of PFLAG, Will & Grace, Affirmation, and online dating apps. 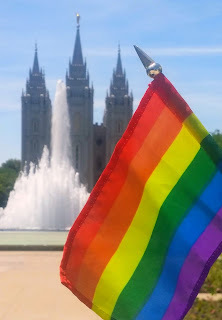 Today there is a visible army of saints who unconditionally love and accept every young LGBT Mormon, no matter what Dallin Oaks says. Even in Utah. All three leading ladies in Squalicum High School’s musical 9 to 5 belted her solo numbers out of the park. Many other moments in the show displayed similar flashes of brilliance. That's what you get when you combine talent, a staggering amount of hard work, a supportive community, an effective arts program, and the well-founded delusion you can do anything. The result is unadulterated joy. It’s the same joy you see in Vancouver Men’s Chorus, regardless of whether you’re watching or performing. It’s the same joy you see with Seattle Men’s Chorus, and with the new gay men's choruses in Newfoundland and Nova Scotia. It’s the same joy I felt while doing drama in high school – even in Utah in the 1980s. And it’s the same feeling I experience as Squalicum High School and Fairhaven Middle School embrace my family today. The opposite of “triggering” is love and joy. The ways of the Web are mysterious. I can’t resist sharing this research anecdote. I wanted to end my essay “High School Musicals” with a photograph of a bosomy Dolly Parton drag queen standing in front of a gay men’s chorus. However, I couldn’t find a single such photo out there online. Shocking, right? 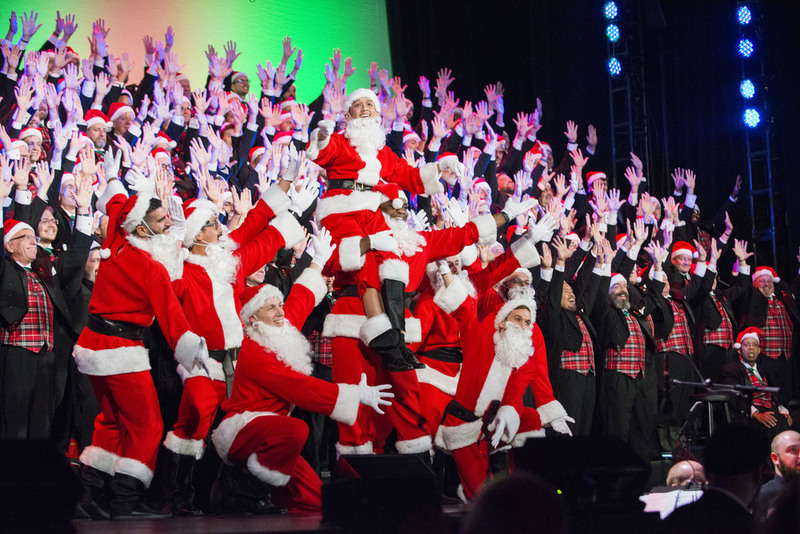 I ended up settling for a cute pile of Santas in front of the San Francisco Gay Men’s Chorus. ’Tis the season. This is a photograph of Oliver and me in 2012. We’re in Denver for the international festival of LGBT choruses. Compare the photo with one of me today. Back then there was no white in Papa’s hair, and I still had imaginary bangs on both sides of my forehead. I blame the children. And/or prejudice. For everything. 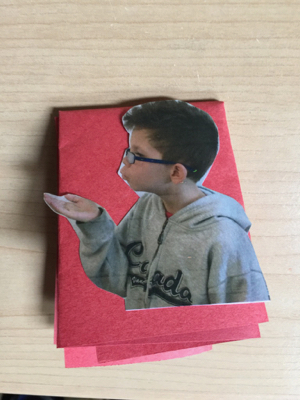 Google Images’ green-striped photo comes with a link to “Sure of You,” my heart-warming tear-jerker about the time my adopted son attempted to send a Mother’s Day card to his birth mother. Go figure. I was way too introverted for theater to be an outlet, though I was secretly very jealous of friends who could get up on stage, put on another identity, and make the audience laugh, cry, curse villains and root for heroes. I did sing in choirs (though was notorious for fainting in the middle of performances). My faith was my coping mechanism. So, nope, I didn't get laid in college either. :-) As you well know. Now that you mention it, you do look really Jewish. And you also look surprisingly distinguished in a beard.